Merry almost Christmas! I’ve been crafting incessantly for the past three weeks, making gifts and getting ready for this, my favourite holiday. I’m frankly crafted out, and looking forward to simply watching people receive my creations for the next couple days. 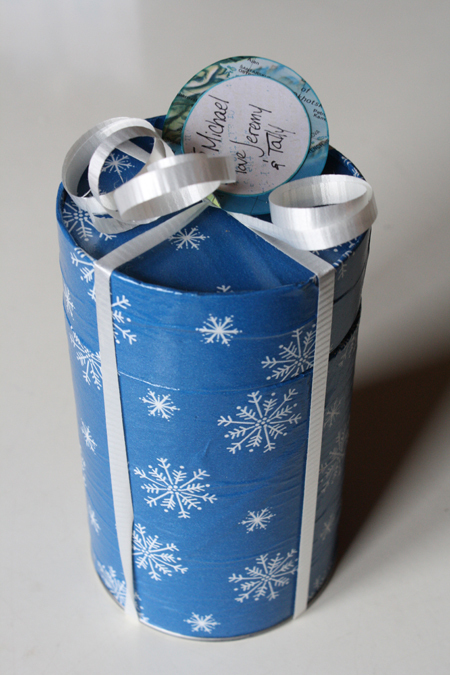 1) Make a simple paper box to put your small gifts inside. The internet is full of wonderful box tutorials and templates. Here’s a link to a whole host of them. And here’s the template and tutorial I based mine off. Use pretty paper or decorate the box itself and you’ve eliminated the need for any kind of wrapping paper whatsoever. 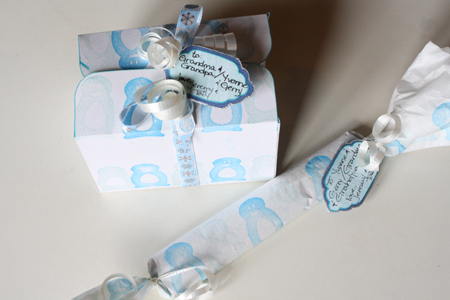 2) Use stamps to dress up a plain white paper box or plain white tissue paper. If all you have around the house is computer paper, this is a great way to make it more interesting. If you don’t have stamps, make some out of a potato and use washable markers instead of an ink pad. Or doodle on the paper. If you’re not a doodler, trace around a bunch of jar lids with different coloured markers or crayons, overlapping circles or other shapes. 3) Use an empty a toilet paper tube. This is perfect for small delicate or awkwardly shaped objects, and saves you buying an expensive box (or making one). It’s great if you’re pressed for time. 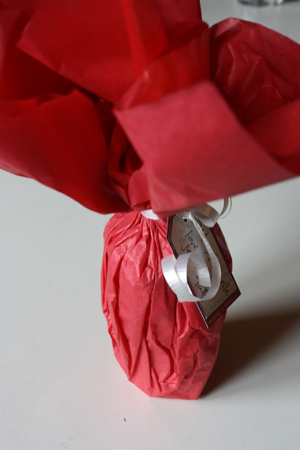 Just put the gift in the tube, then situate the toilet paper roll in the middle of a square of tissue paper and pull the paper up around it, tying it in place with some ribbon. This is also a very lightweight option if you’re mailing things. 4) Go the classic minimalist route by using newspaper or some plain brown butcher paper. 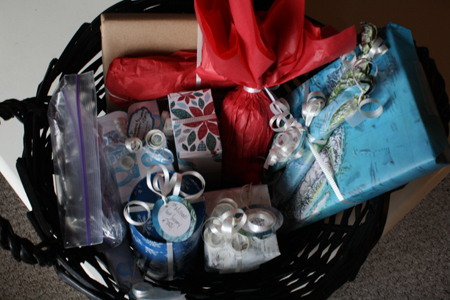 You can stay simple by tying it up with string, or go fancier with ribbons and colourful tags. 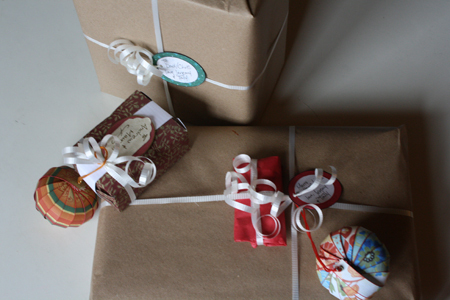 This year I’ve also tied some of my paper ornaments to the outside of gifts, which adds another splash of colour. 5) Maps! 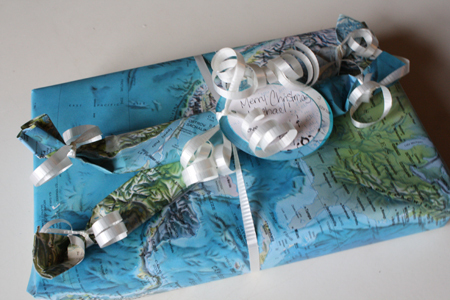 Old atlases are good for a whole bunch of things, and wrapping paper is definitely one of them. They’re colourful, unique and the paper is sturdy and doesn’t tear easily, so they can be reused. You could also try colourful magazine pages or old sheet music. 6) Use this wonderful tube box tutorial to make an adorable, reusable container. Her instructions call for PVC pipe, which is perfect if you’re mailing these containers and need them to be extra sturdy. I’m not mailing mine, so I substituted a Pringles can. You can get two good sized containers out of one can, plus on one of them you use the can’s original bottom and don’t have to create a new base. 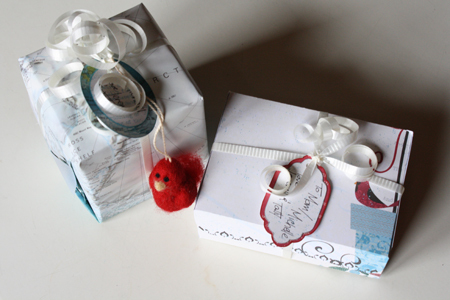 7) And finally, cute tags always dress up and unique-ify a gift. Make them from scraps of fancy paper, old greeting cards, or whatever else you have around the house. Layer a smaller shape on top of a larger one (two ovals or rectangles are the simplest options) for extra colour and fanciness. Now enjoy a peaceful holiday with your friends, family, pets, stuffed animals, a good book or movie and/or your own wonderful self. Merry Christmas, everyone! paper ornaments – it’s Magic!